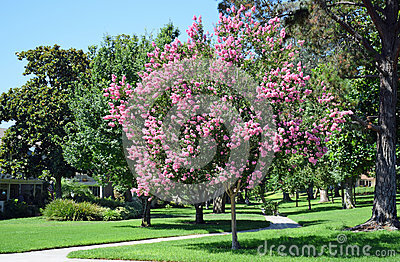 Lagerstroemia, commonly known as crape myrtle or crepe myrtle. Lagerstroemia, commonly known as crape myrtle or crepe myrtle `banaba` Tagalog, is native to the Indian subcontinent, southeast Asia, northern Australia, and parts of Oceania. These flowering trees are beautifully colored and are often planted both privately and commercially as ornamentals. Flowers are borne in summer and autumn.The common crepe myrtle L. indica from China and Korea was introduced circa 1790 to Charleston, South Carolina, in the United States by the French botanist André Michaux. Photo location is Laguna Woods, California.